Notice the sporadic ornaments, Princess helps me decorate. That is my front door to the left, I put wrapping paper and ribbon on it to look like presents! 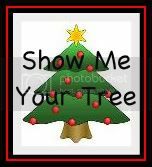 Carrie with Children is hosting a "Show Me Your Tree" blog hop! Go to her blog and grab the blog hop button HERE for your own site and link up your Christmas tree/decorations post, then start hopping! If your participating, leave your link in a comment and Ill be sure to stop by your blog! I wanna see your Christmas Tree!! Happy Holidays! Your tree looks good!!! Way better than our "Skinny" Tree. We also did our door as a present too! when you see my tree look careful you will notice the tree is even skinner on top lol =). We did however get some cute ornaments on sale which was a plus. Your tree looks awesome! Thanks so much for joining the blog hop and linking up with everyone! Oh I love your tree. I tried to do my door but so far not so good. Love your fun colorful blog, and am following you now. Would love for you to take a visit over at mine and join in. Very cute! Visiting from the "Show Me Your Tree" blog hop! Merry Christmas!